We invite you to visit Ann Arbor to meet our architecture, urban design and urban planning students. 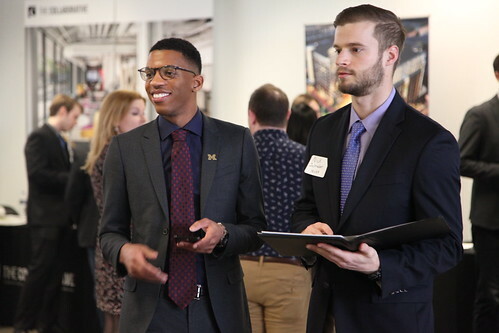 We are pleased to invite you to Ann Arbor for our Career and Networking Fair to showcase your organization and potential career opportunities. Students in attendance will come from our five degree programs: Bachelor of Science in Architecture, Master of Architecture, Master of Science in Architecture, Master of Urban Design and Master of Urban Planning. There is no cost to attend. Registration includes use of a 6-foot table and electrical access as needed during the fair. Interview rooms will be available after the fair and the following day by request. For more information, please email TaubmanCollegeCareer@umich.edu. Registration deadline: Monday, March 11, 12:00 noon EST. Registration has closed. Click here for a list of lodging options in Ann Arbor. Options nearest to north campus include the Holiday Inn, Hampton Inn-Ann Arbor North, Hawthorn Suites and Microtel Inn + Suites.